The barricades were down on Monday. That's the good news out at Ko Olina, the sprawling resort on Hawaii's western shore where we have settled in for a spell. Those barricades and security checkpoints go up prior to Pro Bowl as the players, their families and friends begin arriving at the J.W. 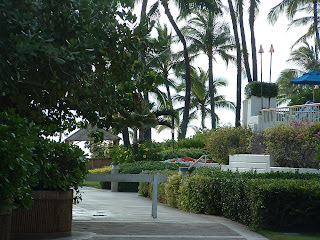 Marriott Ihilani, that shares a portion of the Ko Olina landscape. The NFL - according to the local paper - takes over the entire hotel out here. A practice field is set up next door to it (you can see a goal post from the roadway). The game was played Sunday for those of you who missed it. The barricades, I guess, are to keep players from being pestered by fans. I'm one of the first to admit I wouldn't know a player without helmet and pads if I were to walk into him - they look pretty normal out of uniform. Anyway, the barricades came down so we 'other' guests are now allowed access along the entire beachwalk and into the Ihilani ;you aren't allowed in the secure area without a reservation for a restaurant or spa treatment while they are there. Pro Bowl is big bucks over here. Hawaii pays the NFL $4 million to come to Honolulu for the game and its related hoopla. In 2009 - the last time it was played here - it brought 18,000 visitors who pumped more than $30 million into the economy and tax coffers; so maybe $4 million was a small price to pay. The week prior to ProBowl is chockablock full of autograph signings, appearances by players, parades, block parties, charity visits -- and this year ticket giveaways. The players and their families and friends rent high end accommodations while here, so last year's absence was a costly one according to news reports. 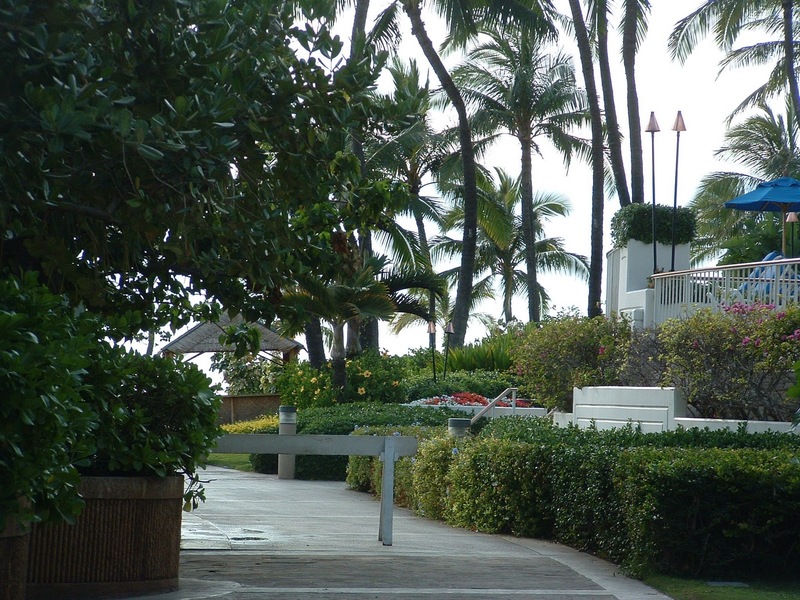 The NFL reportedly takes over the entire Ihilani (one article reported that Michael Vick was in the Penthouse). Several high end beach home rental companies say the increased rentals are up this year. High end resorts in downtown Honolulu reported boosts as well. So back to the barricades. The general manager at the Ihilani was quoted in Sunday's paper as saying that the NFL is a great customer and uses all areas of the resort as well as the timeshare neighbor Marriott Vacation Villas, (that would be where we are) so I wonder if they are using all areas of Ko Olina including areas outside security, are those barricades more pomp than circumstance? Go figure. Go team.